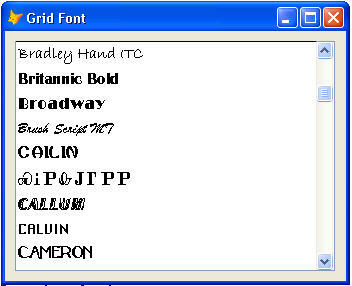 Here is another one that again comes from reading a need of a member inside foxite forum which is to show the list of fonts on the current computer unit in any object possible with an added minor twist, i.e., that aside from the name Arial, the font name should be displayed as well on how the font looks. And because this need is a little unique and basic implementation simple, it now landed among the list of the Grid Tricks shown here in my blogs. Cheers!